What would summer and backyard barbecues be without deviled eggs? They compliment burgers and hotdogs, chicken and ribs. And, there are never any left on the plate at the end of the day. Deviled eggs are inexpensive to make and you probably have all of the ingredients already. 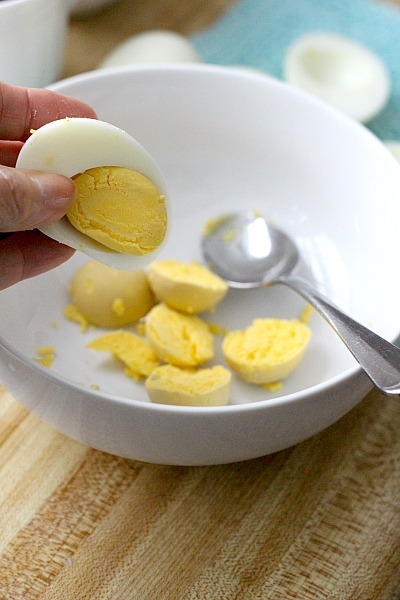 There seems to be two problems that can occur when making hard boiled eggs. One is that nasty green ring around the yolk. It won’t harm you but it looks so unappetizing. The green is caused by a chemical reaction involving sulfur (from the egg white) and iron (from the egg yolk), which naturally react to form ferrous sulfide at the surface of the yolk. The reaction is usually caused by overcooking. Another problem is when the egg shell doesn’t loosen from the cooked egg and chunks of the white stick to the shell leaving a gnarled mess. I’ve heard that very fresh eggs will be much more difficult to peel than older one. So it helps to plan ahead when you know you will be hard boiling them. 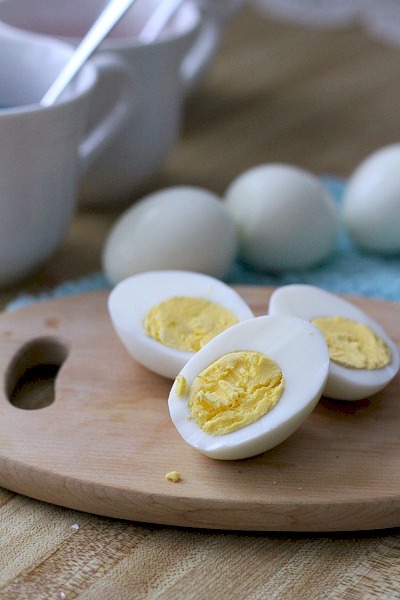 Place eggs into a pan in a single layer, without stacking. 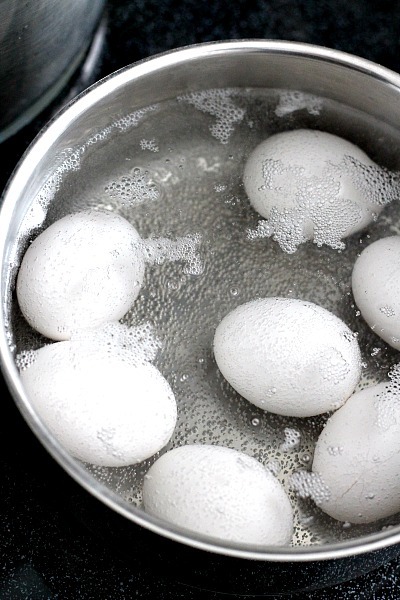 Fill pan with cold tap water, covering the eggs with at least 1-inch of water. Heat over medium-high heat just until boiling. Reduce heat and continue cooking gently for just another minute. Turn off the heat; cover and allow to sit for 25 minutes. Pour off the hot water and run cold water on the eggs while still in the pot. 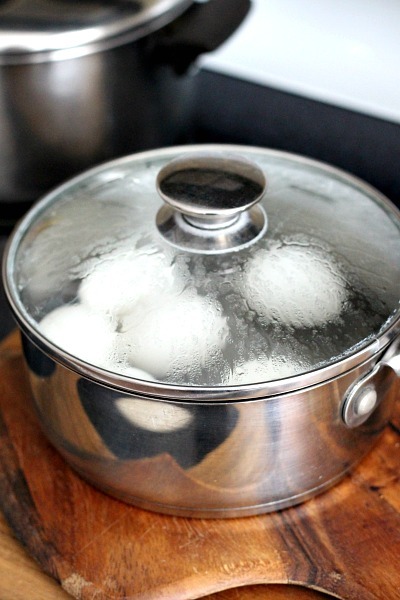 Allow the eggs to cool, changing the water a few times. 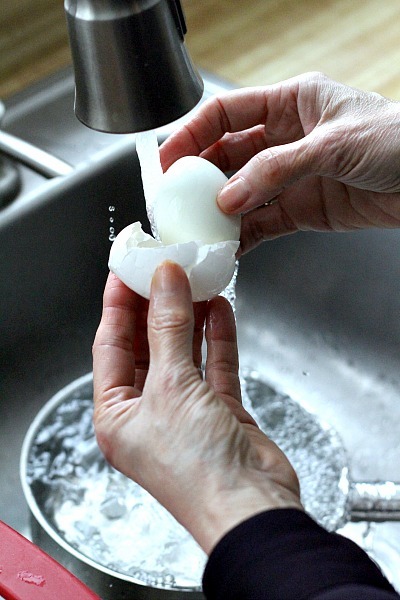 Remove the eggs from the water; crack and peel under cold running water. Nice yellow center with no green ring around the yolk. Combine all ingredients except eggs. Scoop yolk out and mask with fork. Stir in the Miracle Whip mixture. Refill egg whites with mixture and sprinkle with paprika and tiny snips of parsley, if desired. 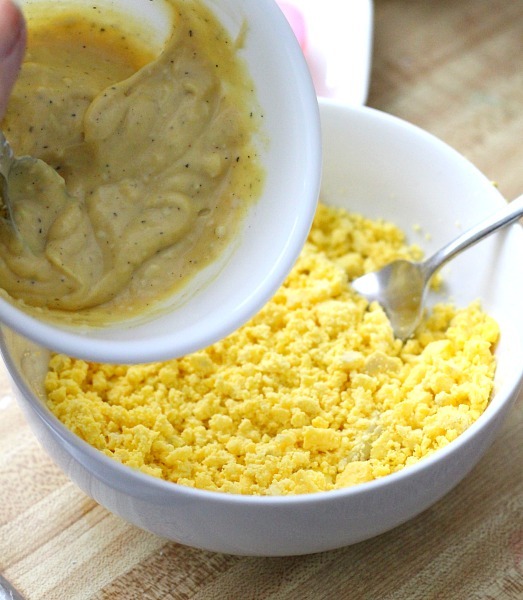 Spoon in or pipe egg yolk mixture into each egg white. 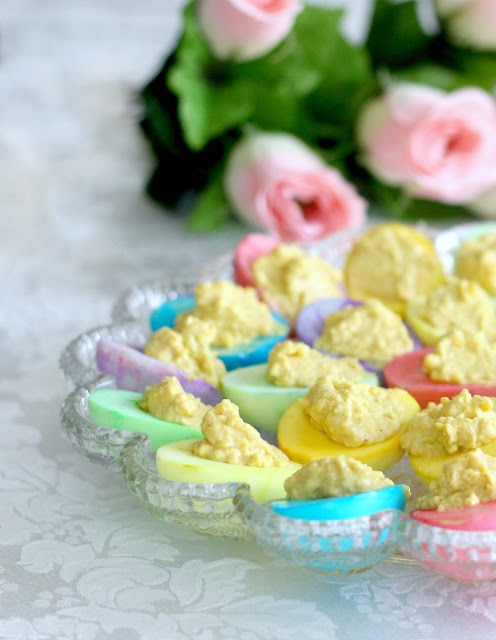 The eggs shown here are made with dyed egg whites for Easter. 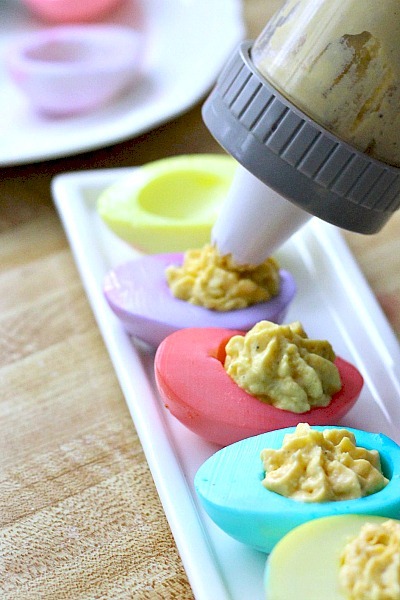 Take a look at Colored Deviled Eggs if you want to see how they are made. I love deviled eggs, too…just like your other comments! I make mine with cottage cheese…makes them very light and fluffy! Looks delicious. Hope you're enjoying the weekend! You feature the most beautiful posts, and they are always so interesting. I find my visits here most enjoyable, and I look forward to the time spent here. Deviled eggs =summer/picnics 🙂 I have always used Tasha Tudor's receipt which is delicious btw. I just love a good deviled egg….LOL! Enjoy your get together! 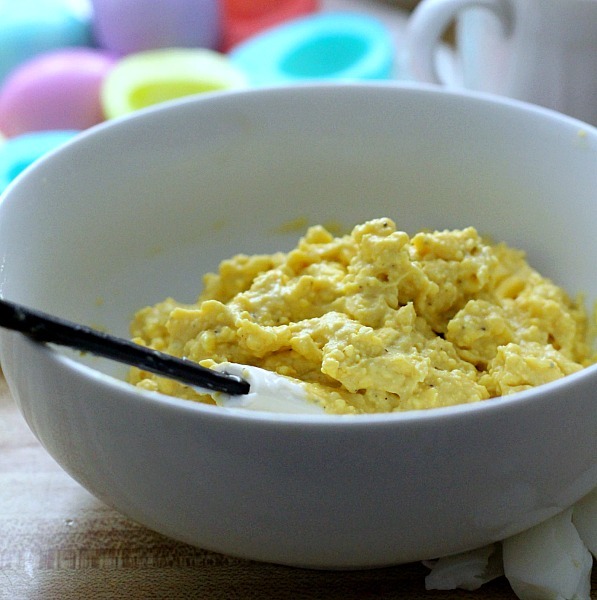 I love making deviled eggs, and it's so nice to have our own layers to provide the eggs too. I love the photo, and can't wait for my basil to get going this year. 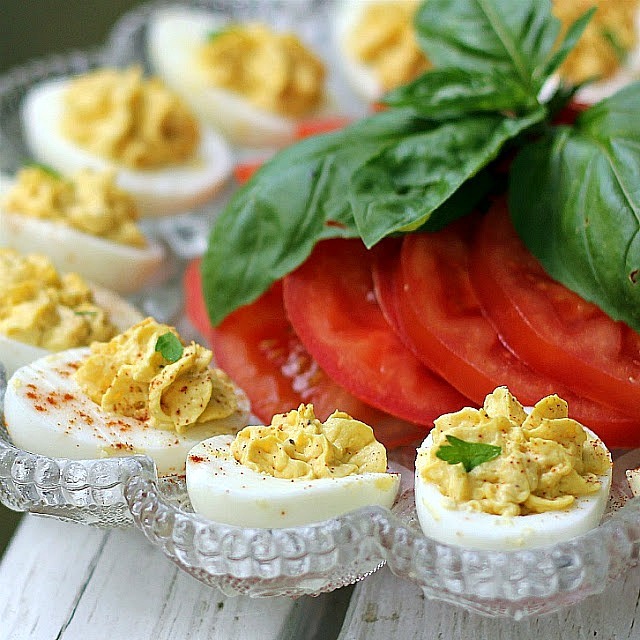 Love deviled eggs, they look amazing. Now I want some. Everything you do is so nice! Beautiful photograph. I have the same plate! No picnic is complete without them! Enjoy the weekend.